It's Monday. Welcome back for another edition of Observe and Fight, The Boxing Observer's compilation of observations and random thoughts from the week that was in boxing. Get caught up on some of the most recent events you may have missed out on, including the robbery that wasn't Pacquiao-Marquez III, Floyd Mayweather's next step, the Cotto-Margarito Face Off, the UFC's big letdown, and much more. Without further ado, check out the latest observations from The Boxing Observer. Marquez might have felt robbed, but there was no robbery Saturday night. With the naked eye and the pageantry surrounding the fight, I tried to be as neutral as possible. According to CompuBox stats, I did a pretty damn good job of it. I gave the fight to Pacquiao 7 rounds to 5. 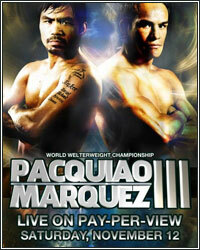 Pacquiao outlanded Marquez 176 to 138 and landed 17 more power shots than him. But a fight cannot be judged based on the stats alone, so I went back Sunday morning, put the volume on mute, and watched the fight again. The second time around, with no sound, I scored the fight a draw, giving Pacquiao the final three rounds. All the Twitter and Facebook posts about how Marquez was robbed is just plain ridiculous. Each round is its own fight, and what happens in the previous round does not affect the next round. The only thing the scorecards proved is that Pacquiao and Marquez are made for each other and we may never truly know who the better of the two is. But make no mistake about it, there was no robbery on Saturday night. It's easy to root for the underdog, but that shouldn't sway the scoring system. I've got no problem with anyone who had Marquez winning the fight, but to have anything wider than 115-113 for Marquez, or even Pacquiao for that matter, is a sham in my opinion. This was a very close fight and some rounds could have gone either way, but fans must look at the rules on how to score a fight, and not score close rounds for the guy they want to win. Each round is scored based on the following criteria: effective aggression, defense, ring generalship, and clean and hard punching. Both men had plenty of moments and both hurt each other throughout the course of the fight. So many of these rounds were very close and the fans who had Marquez winning by a wide margin need to go back and consider these factors when looking at who one each round. Don't just give the round to the fighter you hope wins. That's a real robbery. Floyd Mayweather should have no problem handling Manny Pacquiao. Styles make fights and if Juan Manuel Marquez can effectively counter-punch Pacquiao, what do you think the most skilled fighter in the sport is going to do? Mayweather brings everything to the ring that Marquez does multiplied by 10. He is crafty, skilled, a great counter-puncher, and has more power than Marquez. Mayweather's style is not good for Manny Pacquiao and I can't see any way Top Rank puts Pacquiao in the same ring as Mayweather anytime soon. Floyd Mayweather will have to find someone else to dance with on May 5th. Bob Arum better be thanking his lucky stars. There is no way in hell that anyone thought this fight would be competitive. Most had Pacquiao stopping Marquez late. Was anyone else thinking they wished they were inside Bob Arum's head as Michael Buffer read the judges scorecards? When this fight was announced, Arum said all the right things to promote it, but he did not actually believe Marquez had a chance. The fans are the ones usually duped by the promoters and networks into thinking the fight will be worth the money. This time, the only one that duped us all was Juan Manuel Marquez. I would pay pay-per-view money to watch these guys fight again. No questions asked! Did Manny really have leg cramps this fight or was he simply exposed? Freddie Roach stated that Pacquiao began to cramp up in the 4th round which hindered him throughout the fight. This was supposed to be the best training camp Pacquiao ever had, and Strength and Conditioning Coach Alex Ariza didn't change much in training for Marquez. What changed this time? One of the main reasons Ariza was brought on in the first place was because of Pacquiao's issues with cramping and shin splints during fights. Either Ariza didn't properly prepare Manny Pacquiao for this fight, or Freddie Roach is making an excuse for his guy's performance. You make the call. Miguel Cotto isn't doing himself any favors in the lead-up to his rematch with Antonio Margarito. During the HBO Face Off with Max Kellerman, Cotto stated it was "stupid" that Margarito was willing to die in the ring. Max Kellerman handled the comment with complete professionalism, saying he believed Cotto had a valid argument, but in boxing, that gives the other guy an advantage. Cotto all but stated that if he felt his health was in danger, he would quit. He also accused Margarito of using illegal hand wraps after never making a real claim before. Why now? The closer this fight gets, the more I'm tempted to put my money on Antonio Margarito, and I'm not much of a betting man. The first fight was at 147 pounds and Margarito walked through Cotto's punches. It's doubtful it will be any different at 153 pounds. Cotto's psyche is clearly damaged and Margarito is going to impose his will once again. The UFC had a huge chance for a major statement Saturday night, but it turned out to be a big disaster. Dana White, who has been such a marketing genius promoting his company, made a huge mistake by putting all his eggs in one basket Saturday night. The heavyweight contest between Junior Dos Santos and Cain Velasquez was promoted as the biggest fight in UFC history. The fight lasted all of 64 seconds with Dos Santos knocking Velasquez out. A lot of UFC fans were left disappointed due to the lack of action. I give White credit for what he has done for mixed martial arts, but he dropped the ball Saturday night. Timothy Bradley looked pretty good Saturday night, considering it was against Joel Casamayor. Bradley didn't put out strong performances in his previous two contests against Devon Alexander and Luis Carlos Abregu. After an almost 11-month layoff, Bradley needed to make a statement against an overmatched opponent on a national stage. In my opinion, he did just that making Casamayor, a former world champ, look like a C-class fighter. Bradley's strengths were on full display and he did more to put himself in line to face Manny Pacquiao than most of Pacquiao's previous opponents had done. Don't be surprised to see Bradley take one more fight before he steps into the ring as Pacquiao's next opponent. Mike Alvarado will be Timothy Bradley's next opponent on HBO World Championship Boxing. The heart and will Alvarado showed in his comeback knockout victory over Breidis Prescott was impressive enough to land himself a main event showcase against a big name fighter. Bradley's speed would be too much for Alvarado and Alvarado's aggressive nature would be a big enough sell to land Bradley a fight with Pacquiao. It makes sense for Arum to make this match-up after both Alvarado's and Bradley's performances Saturday night. WBA super welterweight champion Austin Trout looked good Friday night, but he can't bang with the best of 'em. While I was impressed with Trout's performance in stopping Frank LoPorto, he didn't convince me that he is ready for a top 154-pounder. Trout is clearly not much of a talker, but his words are meaningful. He challenged anyone in the division who didn't think he deserved his title to come and take it from him. Trout still has a lot to improve on, but he is a fan-friendly fighter who I'd like to see back in the ring. Don't be surprised to see him get a shot at the winner of the Pawel Wolak vs Delvin Rodriguez rematch December 3rd, or a chance at a unification bout with IBF champion Cornelius "K9" Bundrage. Finally, I wish I could have gotten to know the late great "Smokin" Joe Frazier. Larry Merchant's tribute to "Smokin" Joe was one of the classiest tributes I have ever seen. The emotion Merchant showed in the video showed how much the man meant to so many people. Even Michael Buffer began to get choked up when speaking about Frazier. It's my hope that all professional athletes have the same effect on others as Joe Frazier did. Athletes are role models, whether they like it or not, and the world would be a better place if these role models weren't getting arrested for sheer stupidity. With the fame comes responsibility and some athletes just need to step up.